Renew clients' feet to leave them softer and rehydrated. 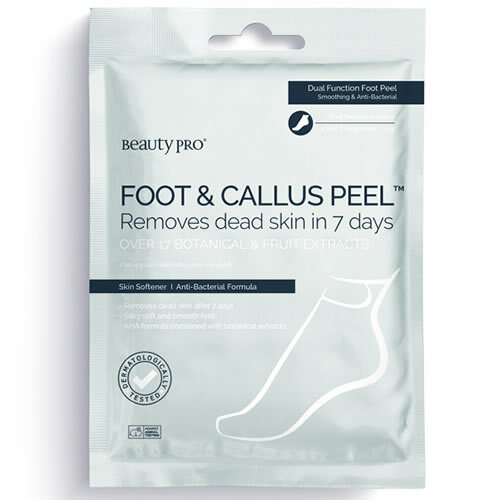 Beauty Pro's FOOT & CALLUS PEEL Foot Peeling Treatment uses an advanced complex of 17 natural plant botanicals to make dead and rough skin peel away gradually over 7 days. These innovative dual layered booties (1 pair) help to remove calluses and rough skin resulting in softer, revitalised feet. They are ready to use straight out of the pack and work most effectively if you use a foot file on extremely rough areas to remove dead skin first. Paraben-free and with no animal ingredients or testing, this wonderful treatment leaves the feet soft, supple and rehydrated. Key ingredients in the formula include Salicylic Acid (BHA Complex from fruit extracts), Glycolic Acid (AHA Complex from fruit extracts), Sage, Anise, Lavender, Olive, Acerola, Kiwi, Banana, Honeysuckle, Peach, Chamomile, Gingko Biloba, Rosemary, Vitamin-E, Lemon and Lime.. Cleanse and dry clients' feet, after which client will need to wear the booties for 90 to 120 minutes for maximum results. Dead skin will naturally peel away after 7 days but clients must leave at least 6 weeks between treatments. Large grain pumice stone block (10 x 5 x 2.5 cm), ideal for removing rough skin from feet. Available singly or in a display pack of 24.